Phat Fiber Video – June Dream Vacation! The Phat Fiber video is live. I haven’t had the chance to watch it – I’m currently watching a movie with Darling Hubby, but you should check it out. I’m sure it’s filled with all sorts of yummy fibery goodness and then get ready to visit the Phat Fiber site and get a box on Saturday morning! 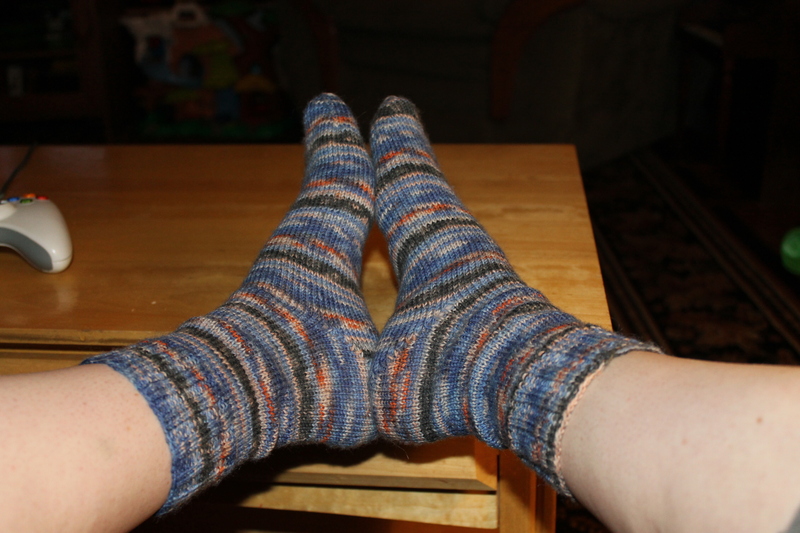 I finished another pair of socks in record time this week. 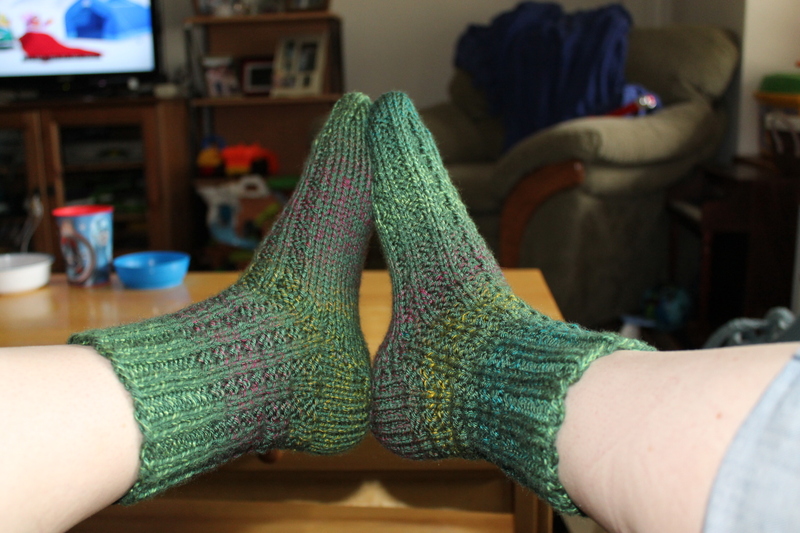 I cast on Monday night at Craft Night (because I was tired of making hexes and because I was at our agreed upon stopping point for the Carousel sock and wanted something else to work on) and had both socks completed by Sunday afternoon…less than a week. It was kinda a belated birthday present to myself, since my birthday was Friday. 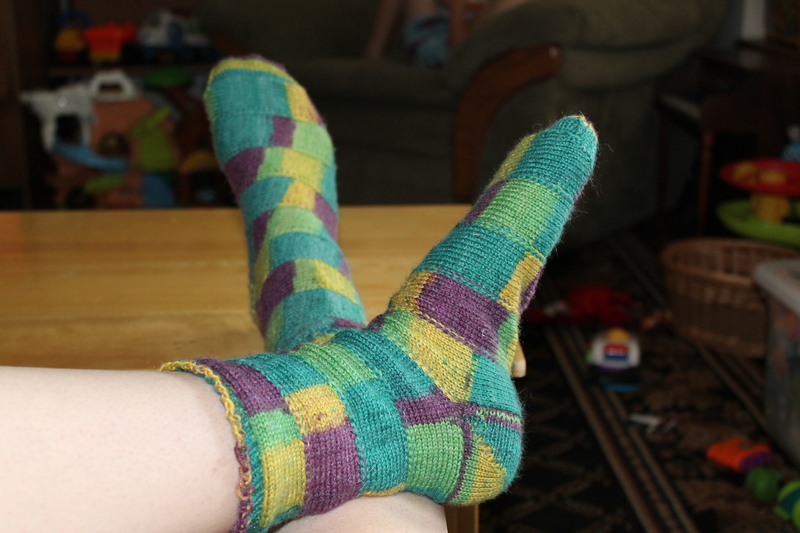 This pair (number 6 on the sock counting tally) is made with Berroco Sox yarn in color 1476. 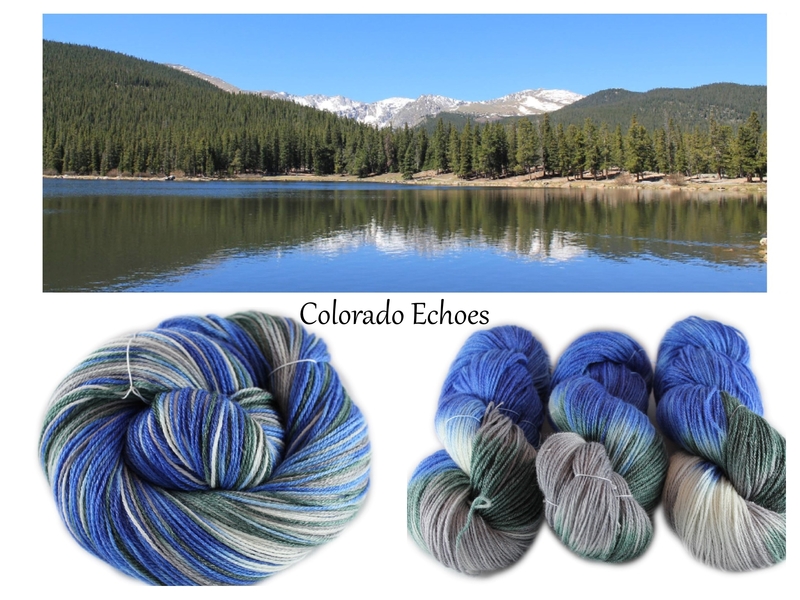 There’s lots of purples, pinks, blues and white in this yarn. 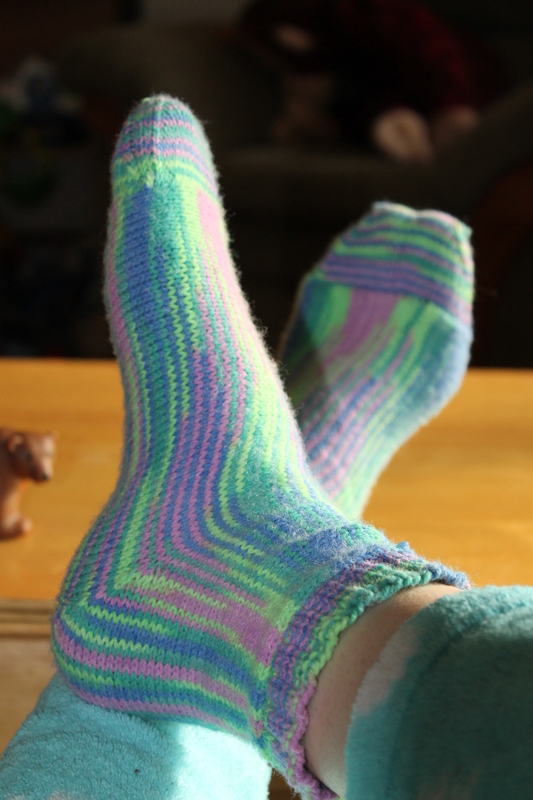 I love doing plain vanilla sock patterns and using a self-striping yarn. 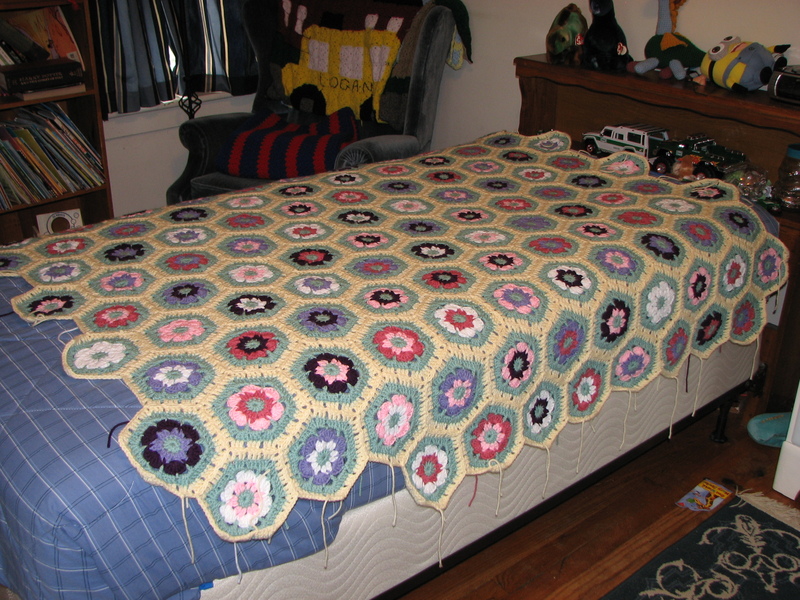 I don’t have to think about what stitch comes next and it’s great for when I want a quick traveling project. This yarn was super fun because the stripe pattern was random and I never knew what color would show up next. 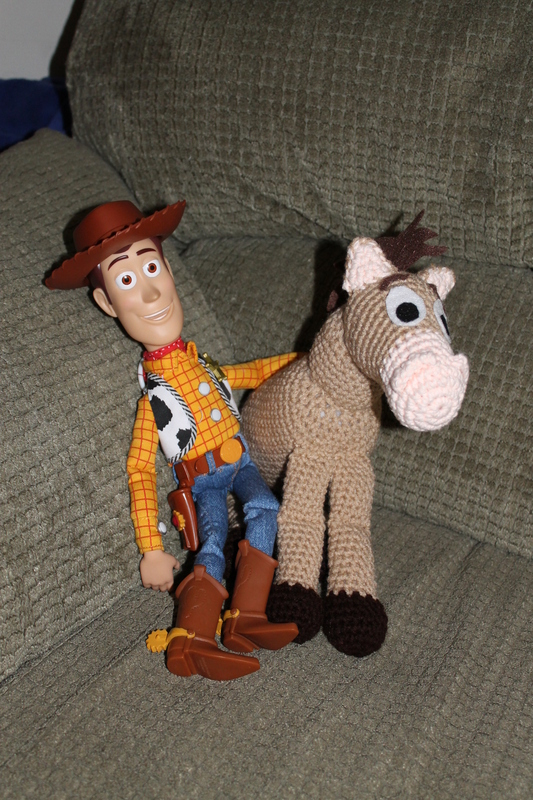 I just wish the yarn was a bit softer. It feels almost stiff in a way, even after washing and drying it. 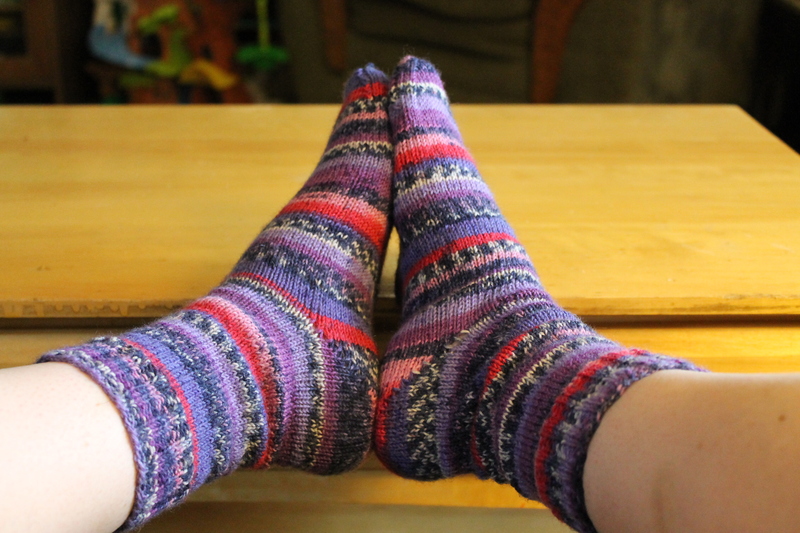 So, I hereby present pair of socks number six (pair number 3 for me) – Berroco Sox in Purples and Pinks. 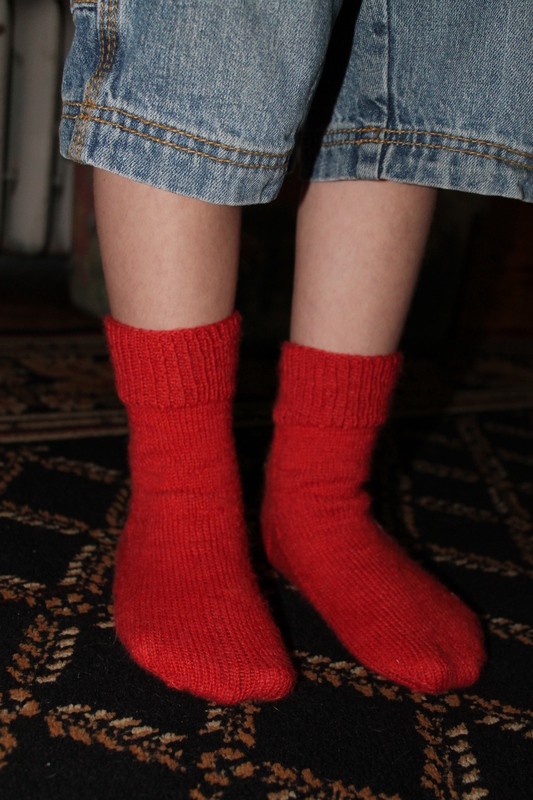 I also finally finished Bug’s Red socks. He was so excited for them that I didn’t want to disappoint. I finished them at Craft Night on Monday and didn’t even have the chance to wash them because Bug wanted to wear them to school the very next morning. 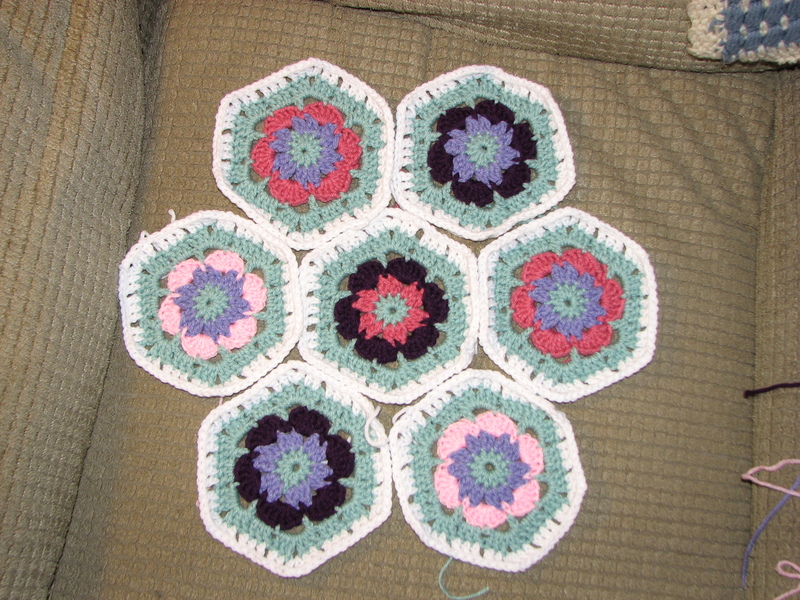 The pattern I used was A Thousand Kisses and it’s a good pattern. I didn’t have a good contrasting color yarn, so I left off the X’s and O’s and make the heel, toe and cuff the same color as the body. 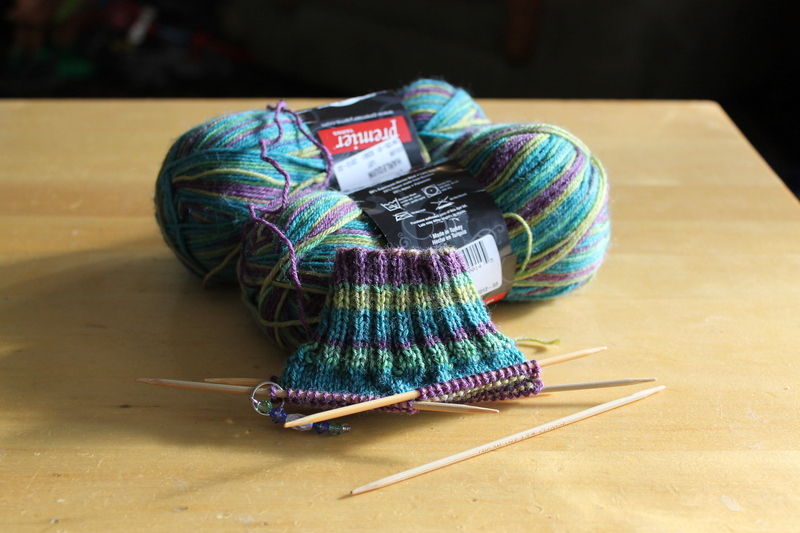 I’ve found that I’m just not a fan of the heel flap and the gusset. I much prefer the short row heel. 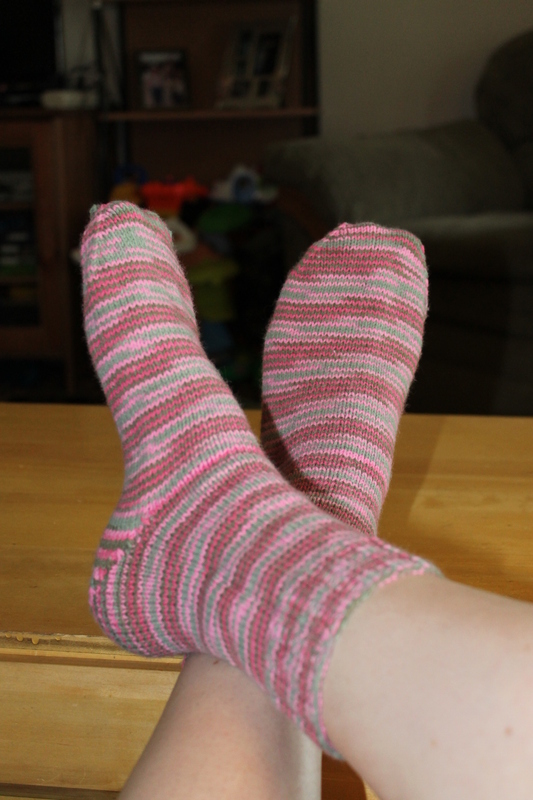 The heel flap is great for when I don’t want to think about what I’m doing and just work back and forth, but I love the simple look of the short row heel. 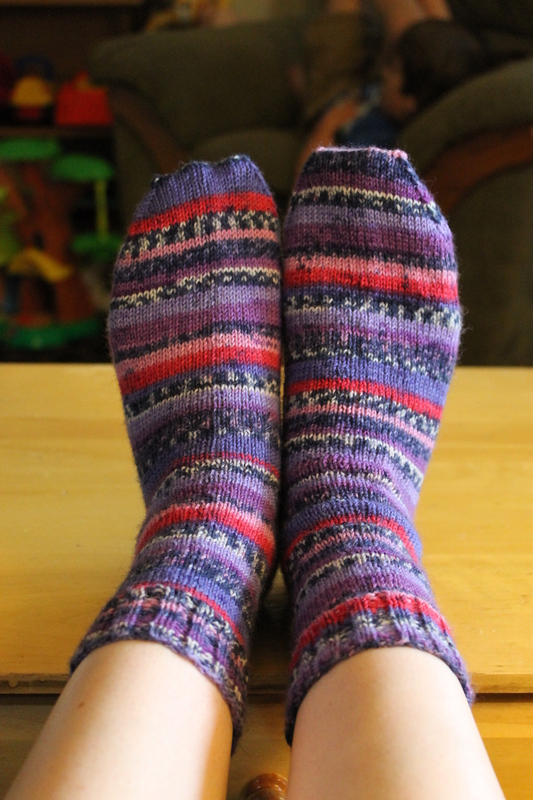 I think for the next time I make Bug a pair of socks, I’ll use the same pattern, maybe with the multi-colors this time and do a short row heel instead.